There is absolutely nothing ordinary about Moroccan Cuisine. From the traditional spicy and tangy taste to the characteristic sugary and minty flavors of some of the most delicious foods, Moroccan Cuisine is famous world over. As a traveler looking to get the best out of your trip to Morocco, eatery options are endless. While you can take the high road and spend some money at a fancy restaurant that serves a pleasing 3-course meal, most locals suggest that the true taste of Morocco lies elsewhere. There is a reason why the cluttered and bustling Medina is always crowded with locals and throngs of tourists who can’t get enough of the traditional Moroccan spices. Truly, the taste of Morocco lies in this street food that many have never even tried. Moroccan Cuisine is a fusion of North African, Arabic and Mediterranean flavors- all combined in a tasteful combination that is quite unlike other foods. There is no better place to find these flavors than the maze-like Medina that has hundreds of stalls set up in groups. So as you stroll along one row, you will find bread sellers huddled together in small stalls with butchers taking up the line in front of them. According to popular research, the three cities that give the best street food experience in all of Morocco are Fez, Marrakech and Essaouira. Housing multiple tourist destinations as well, these three cities are also the most visited ones throughout the country for travelling purposes. Nonetheless, if you ask a friend or family member about the most famous local dishes upon their return from the Kingdom of Morocco, chances are they may not have an answer. Why not? Because while they dine at the 5 star hotels, the Moroccan streets come to life. Remember, if you want to try some of the best, most tasty dishes the country is known for, head out to the Medina after 9pm. 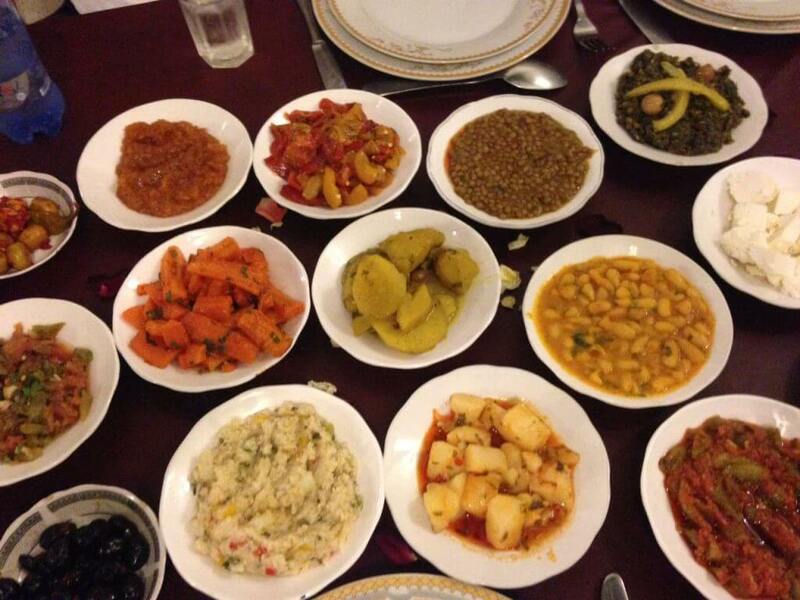 Unlike many cultures, Moroccans like to indulge in several courses of their meal over a period of two to three hours. Considered one of the most opulent dishes in the country, Bastilla/Pastilla may take some getting-used to at first. This Moroccan’s delicacy is a mixture of many sweet and savory ingredients- giving it the signature domed look. A Bastilla has a number of layers of pastry on the outside, with a sweet and spicy filling made with pigeon meat (often replaced with chicken), eggs and almonds. The decorative dusting of powdered sugar on top makes it as beautiful as it is tasty. As a tradition, Bastilla is served as an appetizer, however, if you are new to heavy and rich foods it may well be the biggest serving of appetizer you have ever had. Tagine is a traditional stew of soft vegetables, meat, olives, dried fruits and preserved lemons. 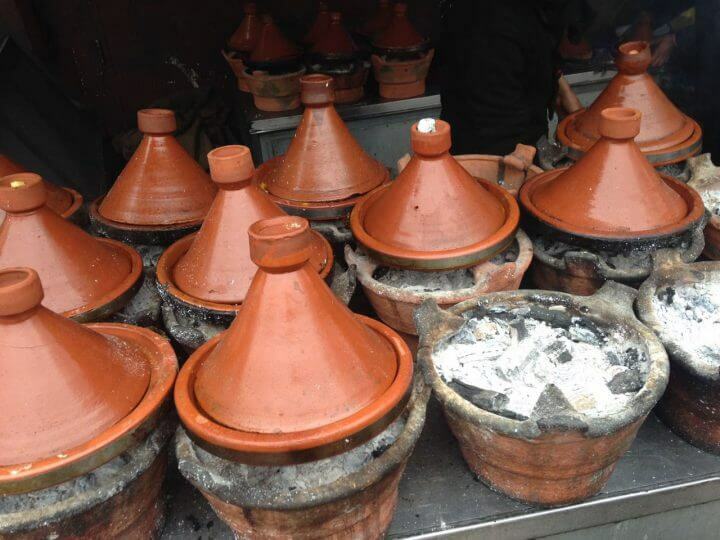 To bring the flavor of Moroccan spices to life, Tagine is cooked in Terracota Cookware for long hours. The best way to make this stew full of flavor is to slow-cook it in a low and wide pot with a lid. If you want to do what the Moroccans do, dip thick pieces of bread, called khobz, in the Tagine to soak up all the flavors before you drink the stew. Try to make some of our favorites-the tender Beef with Prune Tagine or the spiced Fish Tagine yourself! If you are a Cous Cous fan, you have Moroccans to thank. This entrée is one of the most famous ones in the country and people truly know how to enjoy it. One visit to the Medina and you will see people eating Cous Cous with a side of meat and vegetable with their right hand! Rich with Moroccan spices and piled with steaming vegetables, Cous Cous is a beloved dish for visitors and locals alike. While you may occasionally find this dish in many modern households back home, for locals in Morocco, the Cous Cous is a definite presence at every elaborate dinner party. A delicious soup made with tomatoes, chickpeas, lentils, onions and a blend of Moroccan spices, the Harira will definitely be your favorite appetizer all through the trip. Muddy in color, but exquisite in taste, Harira is one those spicy dishes which will remind you of Morocco forever. 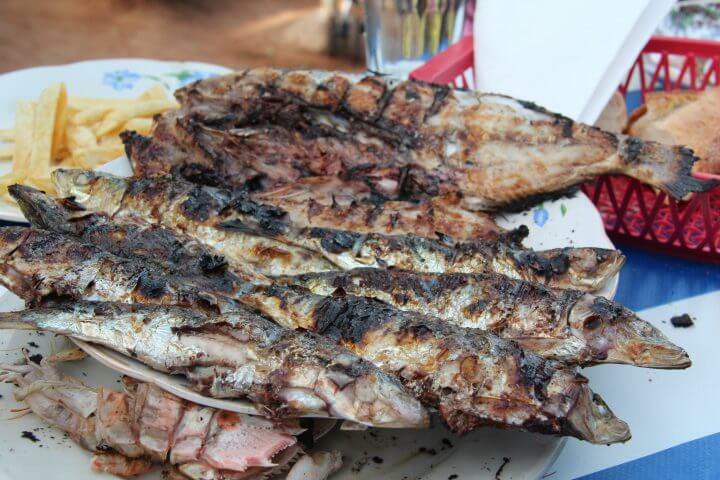 Harira is often enjoyed with hard-boiled eggs and a piece of thick bread. Perfect to be tried on a chilly night just before the Moroccan midnight festivities. Flower shaped, fried sesame cookies, Shebakia is an all-time favorite Moroccan desert. 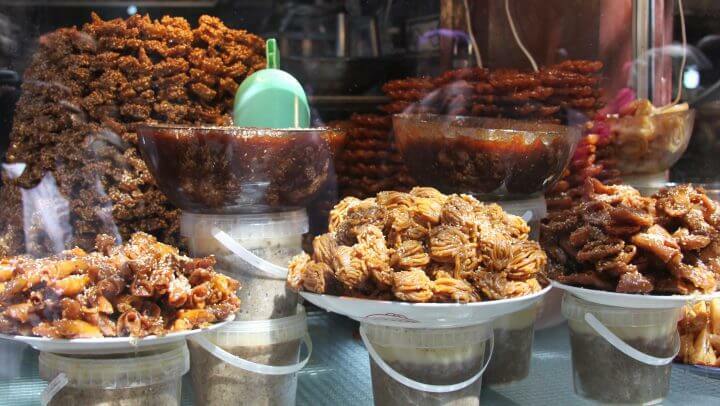 Mostly eaten during Ramadan, when Muslims fast from sunrise to sunset, Shebakia is a must have for every tourist who visits this part of the world. We have a whole post on Street Foods To Try in Morocco – check it out! If you are one of those travelers for whom a day isn’t complete without a hearty meal, Morocco and its specialties will not disappoint you. Want to learn the art of Moroccan cooking from experts in a breath-taking country? Check out the Spices of Morocco Tour.